Fluid escaping through leak site. Sealant building at leak site. Sealant bridging across the leak. Leak sealed. Seal-Tite® International is an oilfield service company that provides leak repair services based on a unique pressure activated sealant technology that uses differential pressure across a leak site to cause liquid sealant to polymerize into a flexible solid.The sealant reaction is analogous to blood coagulating across a cut. The cut is sealed but the arteries continue to flow. 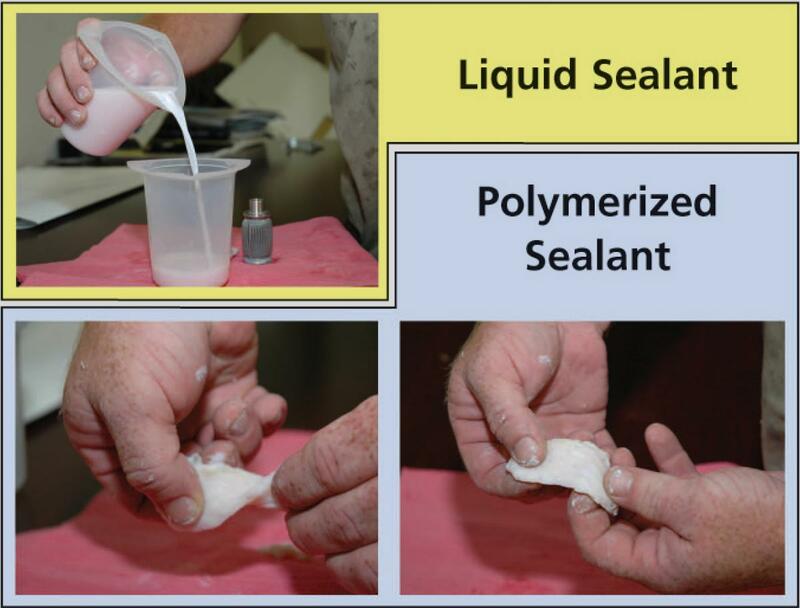 As liquid sealant enters the leak site and encounters a pressure drop sufficient to start the polymerization process, the liquid molecules link together and build a flexible solid seal. The strength of the seal is generally increased in pressure steps until the desired test pressure is reached. Once the seal is formed and tested, the remaining liquid sealant may be left in the system or flushed from the system. Our slogan, Engineered Sealing Solutions, is appropriate for the service we provide. Engineers review the application, prescribe the appropriate sealants, prepare the procedures and follow the operations on each job.A Seal-Tite Technician is required on location to diagnose and cure leaks following the procedures developed for the application. If after diagnostics we determine that the leak severity is beyond our capabilities, he will not attempt to cure the leak. We do not take on jobs unless we are confident we can cure the leak or the customer instructs us to try even though the chance of success is low. Seal-Tite has developed a variety of sealants, both oil based and water based, and in many cases can modify the strength of particular sealants on location to suit the application. Typical service equipment consists of three plastic Pelican Cases enclosing a high pressure low volume air driven pump, sealant injection cylinder, hoses, fittings, hand tools, and an assortment of sealants; all suitable for helicopter transport. Liquid sealants polymerize into 90 durometer elastomers within the leak site.